This is a close reading activity to accompany a piece of text that goes with How My Family Lives in America (Reading Street, Grade 3, Unit 5). However, it can be used alone and not in conjunction with that Reading Street Unit. 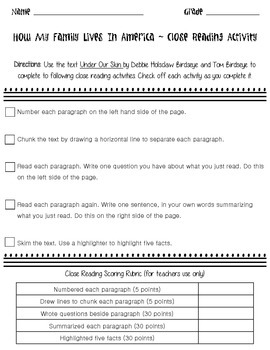 This close reading activity requires students to chunk each paragraph, respond with questions they have while reading, respond by summarizing each paragraph, and highlighting facts found in the text. 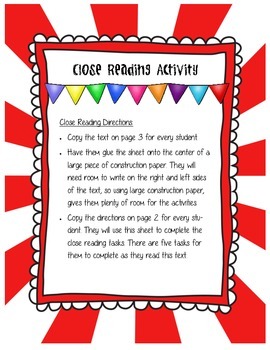 Close reading is an important common core focus and requires students to read, read, and re-read short pieces of text while responding each time. Check out my TPT store for more close reading activities, and for more Reading Street activities that go along with the story How My Family Lives in America. All purchases intended for single classroom use only. Thanks and happy teaching!